Every year my mother made a big deal about Christmas from planning out what color to make the eyes on the gingerbread cookies, to the day she, my brother, and myself would go downtown to Marshall Fields department store for our annual Santa visit and photo. The bright lights and holiday decorations lining downtown store windows and street lamps always made me forget, if only for a moment, our lives were anything but bright and hopeful. I have to give my mother credit, as difficult as our daily fight for survival was, she did the best she could to create happy memories for us. Sometimes, the holiday did not turn out as planned and we ended up on Christmas morning in the emergency room as she received medical attention from injuries caused by my father. My little brother and I viewed stuffing every pocket in our coat and pants with candy canes while at the hospital as a cool thing. Instead of opening presents, like we watched in movies, we went back to the house with a cup of hot chocolate and whip cream prepared with love. Hope was always a magical illusion, it did not matter if it was Christmas or not. The days and months always felt as if they were all lumped in to a never ending road of unpredictable behavior by a man authorized with a gun and a badge to protect the streets of Chicago, while hiding behind the closed door of our home like a coward, only to terrorize and harm his own family. In our house you told time by the changing of seasons and what you needed to wear before heading out the door. 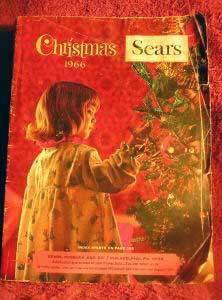 During the holidays it was the one time of year that I didn't wish anything from the Sears catalog that would arrive sometime after Thanksgiving. If Santa was real, then just maybe he would find us a nice safe place like I remembered watching in the movie Miracle on 34th Street, where we could hang our stockings and live happily, with my brother and mom, far away from my father, forever. Growing up, my brother and I never really counted on much and making plans for anything was wishful thinking. More than fifty years later, I have no closure, just an acceptance of the violent events that would eventually hijack my mothers life. The last memory of her is 10 feet away from the oven where we baked Christmas cookies, throughout the kitchen her blood spilled over onto the once bright yellow pattern on the floor tiles where my brother and I once sat anxiously waiting for the Christmas cookies to finish baking. In the bedroom a couple hundred feet away, dead from a self inflicted gun shot, my father, who had taken from me the only love I knew, my mother. Although not visible to the human eye, there is a tattoo etched deep inside of me, a permanent scar from a battle I would rather forget. The effects of the violence would follow me into my own world as an adult, a secret I kept hidden from friends, colleagues and relationships. Suddenly, my secret was out, unwillingly I was a victim and a survivor of a life I did not ask for nor chose as my life's journey. In 1988, my parents divorced and the holidays were around the corner. My mother and I spent the Christmas holidays together, the first without my father and the last one without my mother. I rang in the new year with a feeling of hope that we could finally move forward with our lives. Abruptly, in 1989, after their deaths, I left a successful business career for a world that provided little, if any, hope and assistance to abuse victims and their children. I did not realize when I began working with victims of intimate partner abuse, my world would be an important life raft for safety in keeping others alive. Over a decade of running a national agency and providing direct services, I began to incorporate strategies like no other in the country, as the agencies were not familiar with the battleground I knew intimately. Service providers and agencies were layered by politics and paperwork with government forms and numbers instead of thinking outside the box, a box that never belonged there in the first place if lives were to be saved. This rigid box of "rules and restrictions" are what often kicks the safety and services of a victim to the streets and back to the violence. Yes, a woman returns to the abuser numerous times before she leaves but its also because the family courts and services are either limited or dysfunctional. And all too often it is based on income she makes too much, too little or there is not enough funding available for what is required. Ironically, the funding issues in my world were never an obstacle in keeping victims alive. With little or no resources, each person I assisted did not die. Instead, they moved forward with their lives, most went back to school to obtain degrees others found paying jobs as the sole support of the household turning their lives around minus the threat of violence. I think it was because I took the time with them, something I noticed from the begining that was not happening when a victim reached out for help. I learned from being in the trenches and providing hands on services combined with making time to explain to victims-- meant the difference between life and death. I would go beyond the sterile basic information and red tape of guidlelines set by funders and various government agencies, people who were and continue to do so today, more concerned with tabulating stats of human lives that amounted to nothing more then entering useless garbage into a data base that had nothing to do with safety or leaving and never returning to the abuse or the system for help. One cannot effectively assist a victim of intimate partner by sitting behind a desk when they have never left the comfort of their offices, when they have never been inside the real world of sheer terror and violence that victims endure daily. Often placing victims in something labeled a shelter, government funded that does not in many ways meet the needs of victims. As I have always said like our own DNA no two cases of abuse are alike. The days of placing a bandage on intimate partner violence, as though it were a boo-boo, are over. When a system does what it has always done, the results will be the same. It did not work out for women like my mother, unable to speak today, because they were silenced in the prime of their lives, murdered in cold blood. As we enter the year 2011, know that the death toll across the country for those who lose their lives because of intimate partner violence does not have to be a predictable outcome in some hardwired data base, ultimately marked by a cemetary headstone as in years past. A child no longer has to acompany their mother to the emergency room on Christmas morning filling their pockets with candy canes in a cold waiting room as the doctors stich their mothers head or set a broken limb and sent back out into uncertainty and fear that the next time they might not be so lucky. In the new year I would like everyone who reads this to join me in ending the abuse. How, you ask? Each time a news story about a victim who was killed comes across your facebook page or you read about a case in the Huffington post, AOL News, Google, Newsvine, USA Today, the Examiner, The Washington Post, New York Times or see it on Nancy Grace, Fox News, Good Morning America, MSNBC, the Oprah Show, Dr. Phil, NPR Radio or any number of news programs send them a brief paragraph about the book Time's Up and that these cases no longer have to be tragic. That women such as Susan Powell, Stacy Peterson, Vensus Stewart, Angel Downs, Renee' Pernice, Kathleen Savio and others if killed their words will speak from the grave in a court a court of law. The person responsible will be arrested. The upside is that this book saves lives. The mothers, sisters, girlfriends and children currently living in fear who live in harms way each and every day need this book the most. It is up to us to see that the information and knowledge is in their hands. 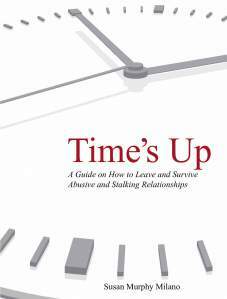 And to ensure every domestic violence agency, court building, library, church, community center, hospital, business and school has a copy of the book Time's Up: A Guide on How to leave and Survive Abusive and Stalking Relationships. And for a domestic violence provider, social worker, first responder, government agency, school, business or individual who says that cannot afford it? You can not afford not too! Susan’s writing is based on doing. It is based on the irrefutable credential of experience, both as a residual victim of interpersonal violence and a tireless advocate for others who suffer. This book is born from working in the trenches for twenty years and the necessity of crafting working solutions to help ensure individual safety from batters and stalkers. TIMES UP is a comprehensive guide for women in danger. Every advocate owes it to those they work to assist to obtain this book.The contents provide specific steps towards safety and addresses issues that a person who is stressed and in fear may not think of. This guide can provide structure in the midst of chaos. 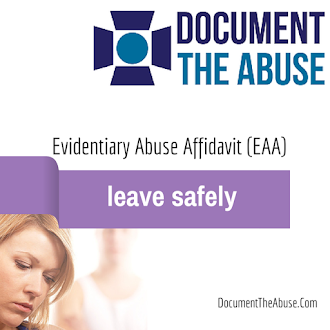 Among the tools and forms is the original idea of an “Abuse Affidavit”, a sworn statement detailing the facts of an individual’s victimization, preserving the specifics so they are not lost even if the victim is. It is difficult to think about speaking from the grave but no different than any life insurance policy obtained in consideration for those left behind. An “Abuse Affidavit” has the additional psychological benefit of being forced face reality and admit that the potential for the ultimate kind of violence exists…and that if it occurs the perpetrator will be held accountable. Susan Murphy Milano is with the Institute for Relational Harm Reduction and Public Pathology Education. She is an expert on intimate partner violence and homicide crimes. For more information visithttp://www.saferelationshipsmagazine.com/ She is the author of "Time's Up A Guide on How to Leave and Survive Abusive and Stalking Relationships," available for purchase at the Institute, Amazon.com and wherever books are sold.